Panoramic view of North Peak from the summit of Mt. Diablo. Looming above the East Bay, Mt. 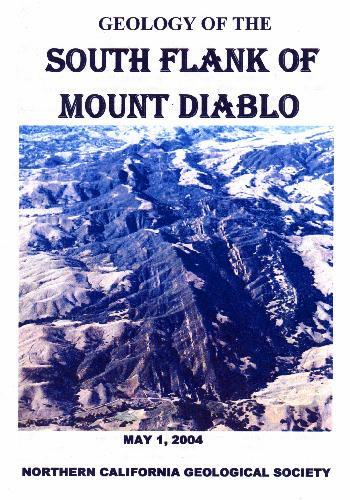 Diablo is the outstanding physiographic feature of the region. Because of its great height and geographic isolation it forms the basis for the geographic reference system (townships, ranges and sections) used in surveying much of California and Nevada. 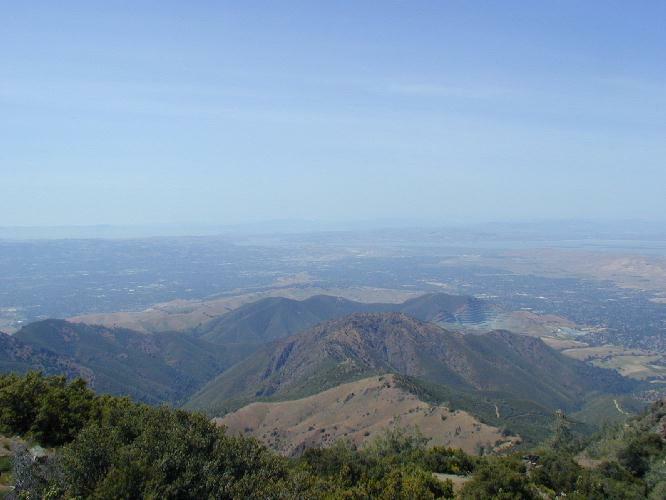 It is one of the four major peaks that dominate the landscape of the Bay Area and, at 3849 feet, is third in height behind Mt. Hamilton in the Diablo Range and Mt. St. Helena in the Mayacmas Mountains. It is reported that the area viewed from the summit is unsurpassed anywhere on earth except for the view from Mt. Kilimanjaro. From the top it is possible to see across much of California from the Sierra Nevada to the Golden Gate (and some say as far west as the Farallon Islands). The origin of the Mt. Diablo structure has been argued for quite some time. Various explanations have included diapiric origins, piercement structures, and volcanic processes. 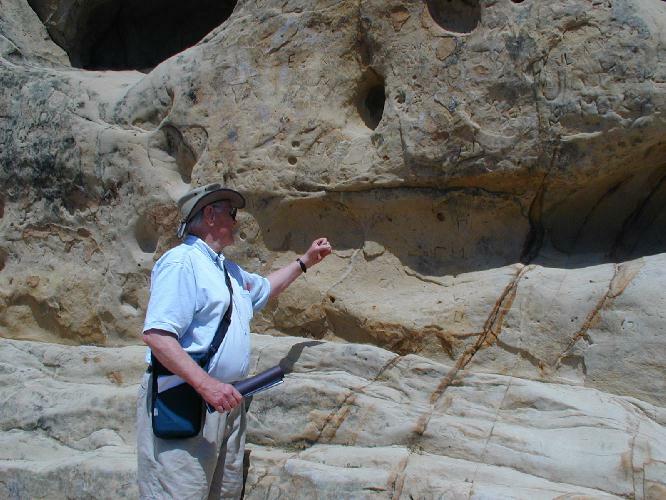 Since his retirement from Chevron, Ron Crane has undertaken a project to map and understand the geology of this feature and the surrounding region. In 1995 he proposed that Mt. 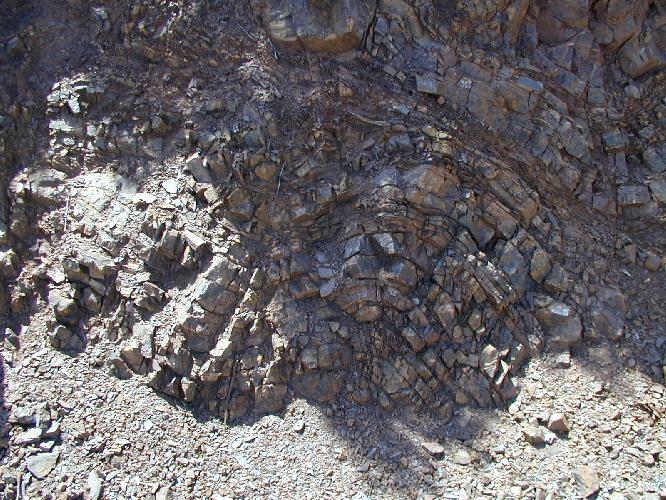 Diablo consists of thrusted rocks folded into the structure of a broad antiform. The antiform originated as a west-verging backthrust that was formed by an eastward driving wedge of sediments in front of the Salinian block. Major compression and uplift of the Mt. Diablo antiform began about 4 to 5 million years ago and is continuing today. Mt. Diablo has been the focus of several NCGS field trips. On Saturday, May 1, NCGS members and friends joined Ron on a field trip to investigate the geology of the south flank of the Mt. Diablo structural domain. Ron led a similar field trip to the north flank in May, 2002. Our day began at 7:30 a.m. at the Danville Park and Drive lot where Ron gave us an overview of the day’s activities. The highlights of the trip are discussed below. Stop 1 was on Peters Ranch Road in Danville west of Highway 680. Here we were in the East Bay Hills domain looking east toward the Mt. Diablo domain. We could see across San Ramon Valley to a series of three low ridges culminating in the Mt. Diablo massif. Each of these ridges was uplifted along a west-verging thrust fault. 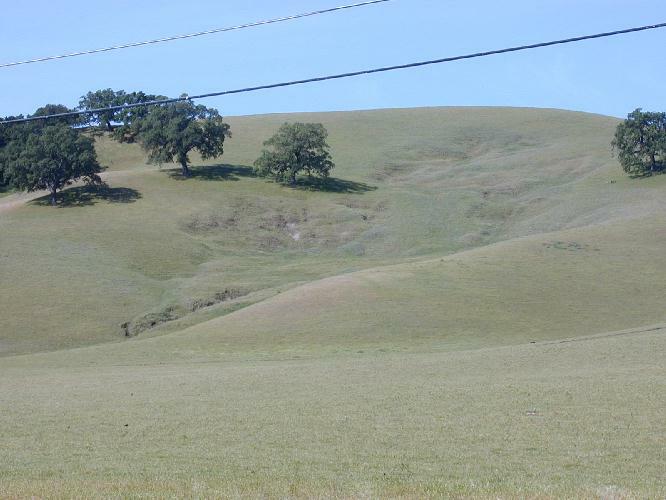 In Ron’s view the Calaveras fault is interpreted as a thrust fault on which the East Bay Hills are being thrust to the east. This interpretation contrasts with the more conventional view in which the Calaveras fault is primarily a strike-slip fault like the Hayward and San Andreas faults. The San Ramon Valley is being compressed (shortened) between the southwest moving Mt. Diablo domain and the east moving East Bay Hills domain. Sediments in the San Ramon Valley have subsided over 18,000 feet. Stop 2 was on Paraiso Drive at the bridge across San Ramon Creek in Danville on the east side of Highway 680. Here we were in the leading or southernmost edge of the Mt. Diablo domain. 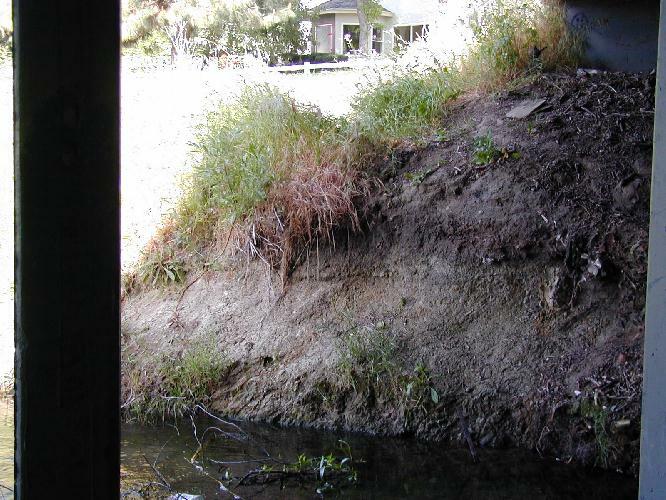 Beneath the bridge over San Ramon Creek we could see nearly vertical dips in the streambed. This deformation and the presence of a small bump in the topography suggest that we were standing on small thrust anticline that forms the leading edge of the Mt. Diablo domain. 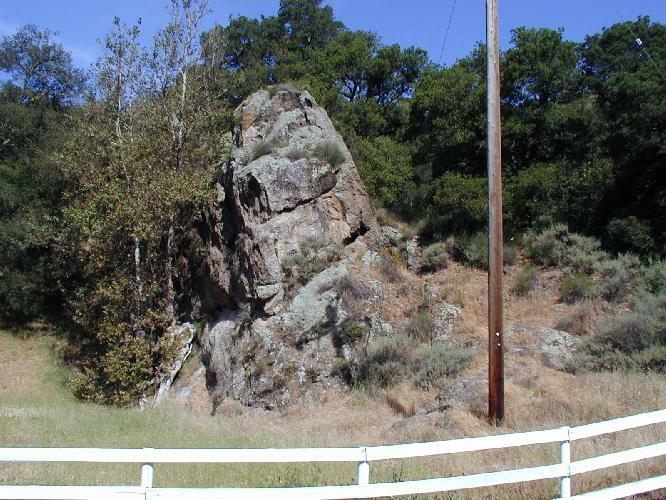 Stop 2: Outcrop exposure with near vertical dips beneath San Ramon Creek bridge – A small uplifted area in the middle of San Ramon valley suggestive of a possible leading edge of a blind thrust fault (Mt. Diablo Structural Block moving to the SW). Earth flow in hills along Finley Road. The hills are underlain by the Neroly sandstone. 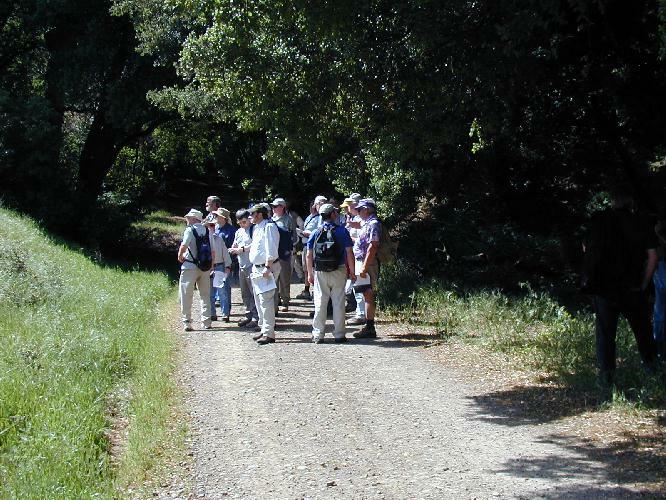 Stop 3 was at the Finley Road entrance to Morgan Territory Regional Park east of Blackhawk. Here we were on the southeast flank of the Mt. Diablo domain. We walked down section on the northern flank of an up turned syncline. 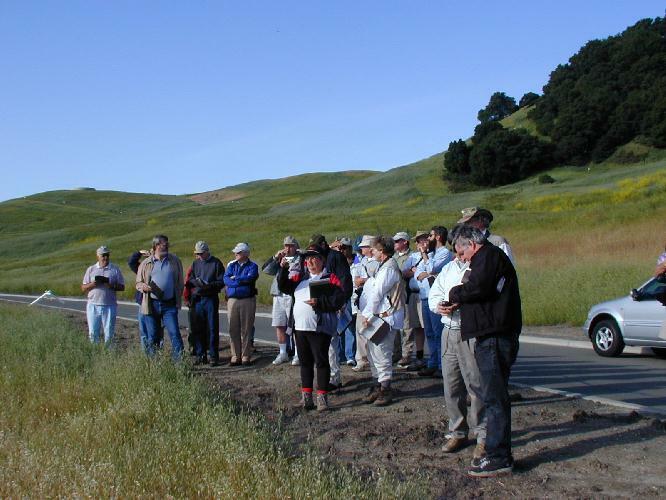 We started in the Upper Miocene section and walked through the Diablo formation, the Neroly sandstones, and the massive Briones sandstones. We continued to the Middle Eocene Domengine sandstone outcrops. We then crossed the Riggs Canyon Thrust Fault that thrusts Upper Cretaceous over Tertiary and Cretaceous rocks. North of the fault we were on an overturned anticline in the Campanian section. Stop 3: An outcrop of the Briones sandstone along Finley Road. Stop 3: The group standing at the approximate location of the Riggs Canyon Fault. Stop 3: A view up canyon of the Briones and Domengine sandstones. For Stops 4 and 5 we drove up South Gate Road to the south entrance of Mt. Diablo State Park and had lunch at Rock City. Here we were again in the up turned northern flank of the San Ramon Valley syncline in the Domengine formation. These Middle Eocene sands of the Domengine formation were deposited down slope of the shelf edge in deep water. 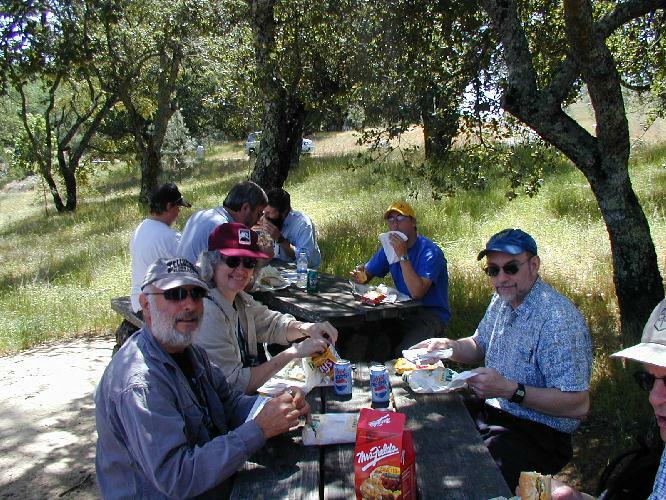 Stop 5: Rock City picnic area, Mount Diablo State Park. Stop 5: Looking for the elusive mortar holes in the Domengine sandstone. The Wind Caves at Rock City are in the Domengine formation. The caves are not formed by wind, but in fact are formed by water percolating through the sand and dissolving the cement holding the sand grains together. 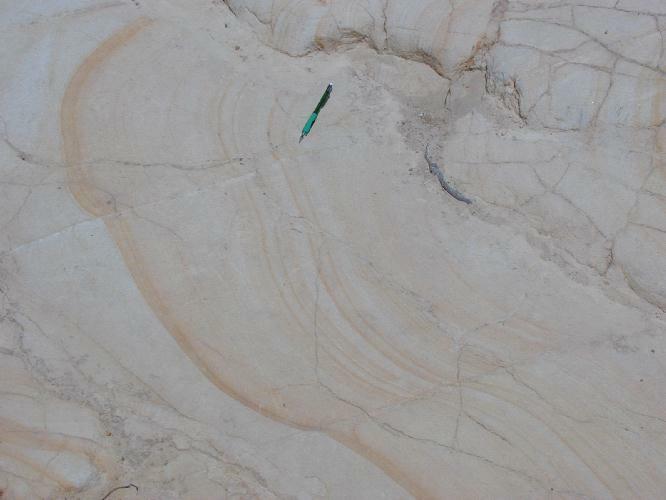 We also observed iron stained bands in the sandstone known as Liesegang structures. These formed as a source of iron hydroxide diffused through the sandstone creating a beautiful banded appearance in the rock. Stop 5: Some of the “Wind Caves” in the Domengine sandstone. Stop 5: Liesegang bands in the Domengine sandstone. Stop 6 was at Curry Point on South Gate Road. The parking area is in a shaley Early Eocene section resting unconformably on Upper Cretaceous Campanian rocks. Here we viewed the south flank of Mt. Diablo. Much of the south side of Mt. 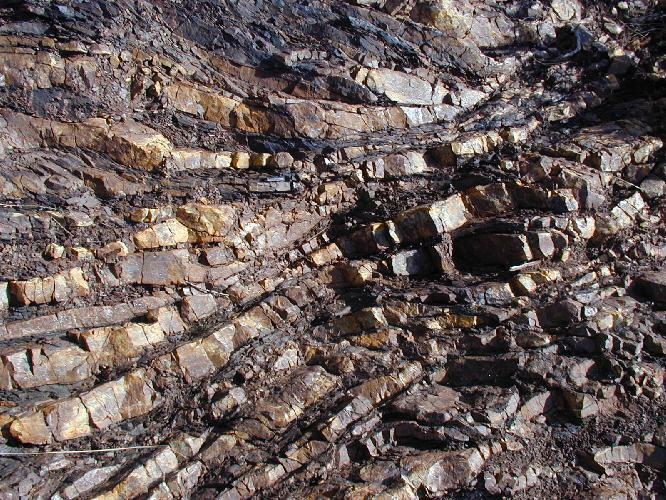 Diablo is composed of greenstone and chert sequences of the Franciscan complex. At the base of this section is the Diablo Thrust that placed the Franciscan complex on Albian shales. 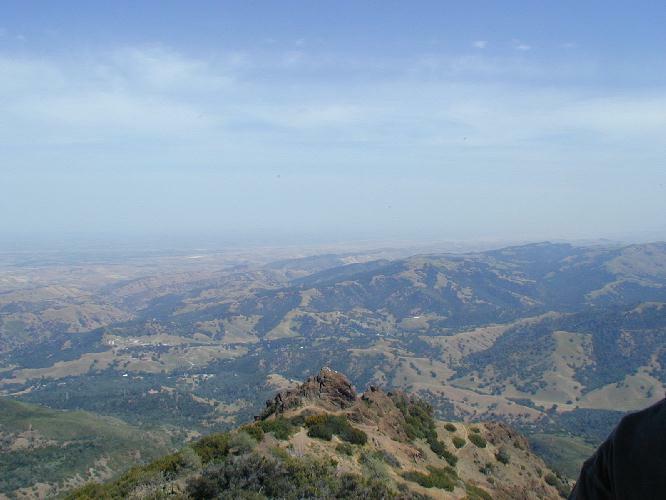 Stop 6: Curry Point – Views towards the summit of Mount Diablo. 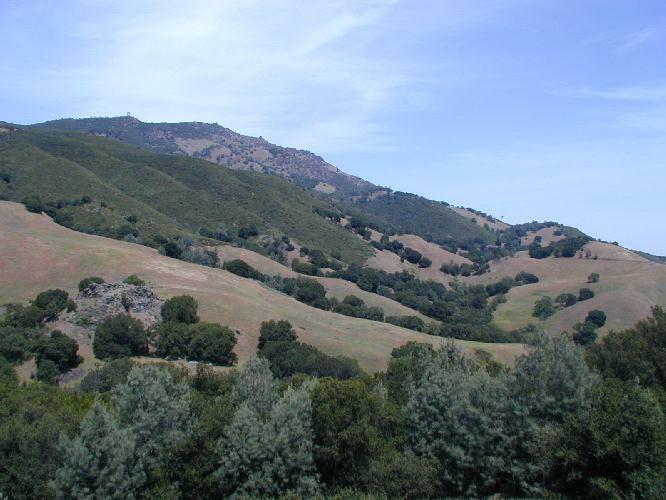 This is a view of the south flank of Mount Diablo. The valley in the foreground is underlain by Cretaceous shales. Early Eocene shales and sands underlie the parking area. 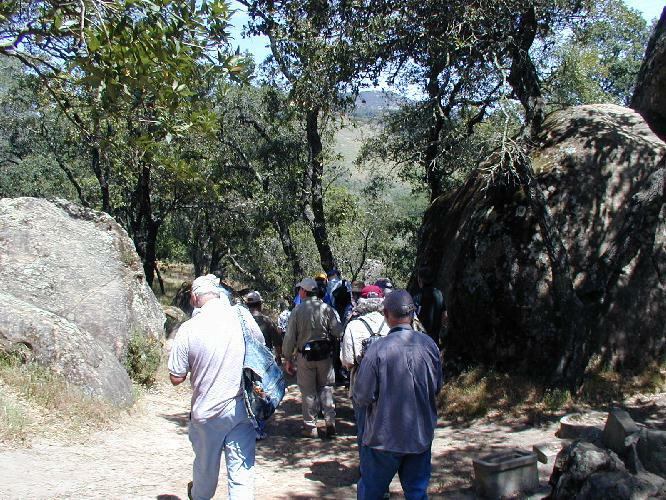 Most of Mount Diablo is composed of Franciscan rocks. The base of this section is the Diablo Thrust. Many landslides bring down Franciscan rocks and obscure the contact. The Diablo Thrust separates the Tertiary and Campanian sediments in the syncline from the thrusted rocks of Early Cretaceous and Jurassic that are involved in the core of the antiform. In Albian time a section of oceanic crust and its overlying sediments was imbricated in the accretionary prism east of the oceanic trench. In Ron’s interpretation a portion of this oceanic crust slid into a subsea trough and rested on Albian shales deposited in the forearc basin. The Mt. Diablo massif consists of a preserved section of oceanic crust including gabbro/diabase, serpentinite, basalt flows and pillows, and chert. In driving from Stop 6 to Stop 7 we crossed the Diablo Thrust. Stop 7 was just up the road near The Pines Camp in the Franciscan complex. Here we had an overview of the entire southern flank of the uplift, and back across the San Ramon syncline toward Stop 1 where we began the day. The ridges are formed by two dominant sand sequences. They are the Eocene Domengine sand and the Miocene Briones sand. 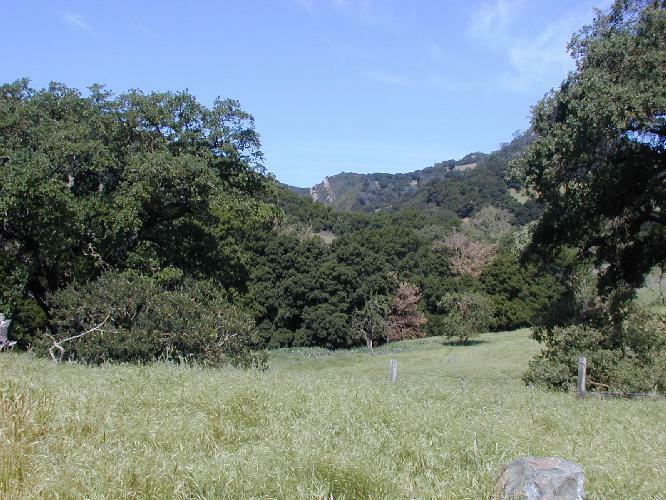 Stop 7: A panoramic view to the south and east across Curry Canyon towards Riggs Canyon. 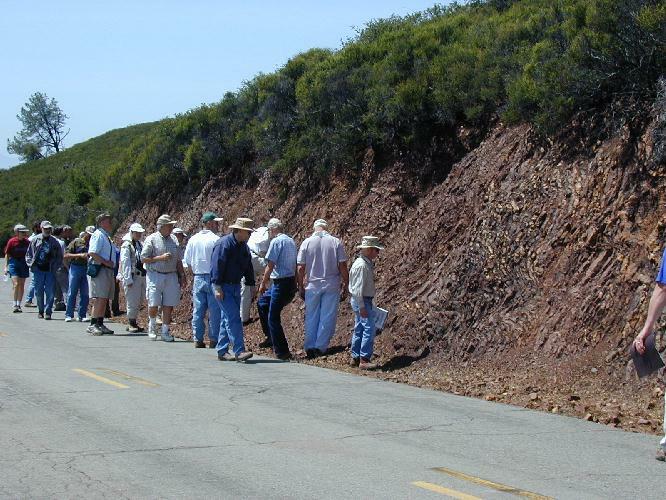 At Stop 8 further up Summit Road we paused to observe some folded and faulted chert beds in the Franciscan. The chert overlies greenstone in other areas not visited on this trip. We continued up Summit Road crossing the axis of the Mount Diablo antiform near Laurel Dell camp. Stop 8: Along the road to the summit. Folded Franciscan radiolarian cherts. Stop 8: The group and the cherts. Stop 8: Folded Franciscan cherts. Stop 9 was in the parking lot at the summit of Mt. Diablo. The Summit Visitors Center is built from fossil-rich Briones sandstone, but unfortunately is closed now. After taking in the view we proceeded to do a half mile hike around the summit on the Fire Interpretive Trail. Here we could see many of the rocks characteristic of the Franciscan including greenstones, red chert, pillow basalts, graywacke, and argillite. Stop 9: Summit of Mount Diablo. A view to the north towards Concord and Clayton. The Lone Star Industries quarry on Mt. Zion exposes sheeted diabase dikes of the Coast Range Ophiolite. Stop 9: A view to the northeast across North Peak. 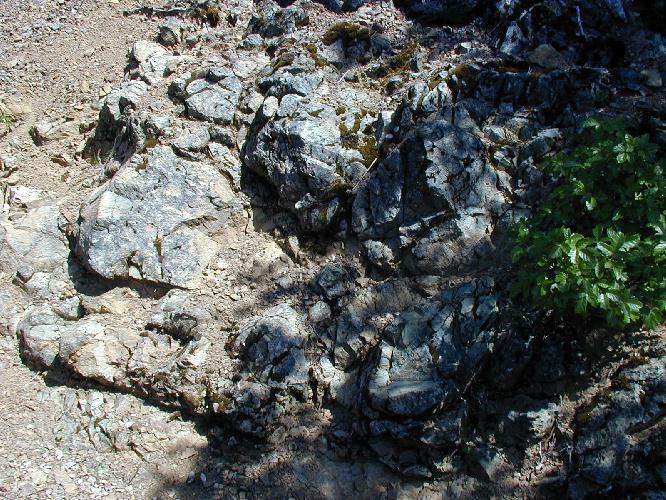 Stop 9: Franciscan greenstone (pillow basalt) along the “Fire Interpretive Trail” that circumnavigates the summit. The NCGS sincerely thanks Ron Crane for leading this excellent field trip and providing the field guide describing the trip in detail. We thank Tridib Guha for organizing the trip, handling trip registration, and arranging transportation. We thank Phil Reed and Don Lewis for their continued hard work getting coffee, donuts, lunches, and refreshments. And, of course, we thank all the drivers for the use of their cars. Diablo Afternoon: An afternoon panoramic view from Stop 1.